Are you looking for concise, practical answers to questions that are often left unanswered by traditional sports medicine references? Are you seeking brief, up-to-date, expert advice for common issues that can be encountered when working with athletes? Quick Questions in Ankle Sprains: Expert Advice in Sports Medicine provides a unique format of concise and to the point responses with clinical application, backed by the latest research on sports-related ankle sprains among athletes. Drs. Patrick O. McKeon and Erik A. Wikstrom and their contributors present 39 common clinical questions regarding the prevention, assessment, treatment, management, and rehabilitation of ankle sprains. 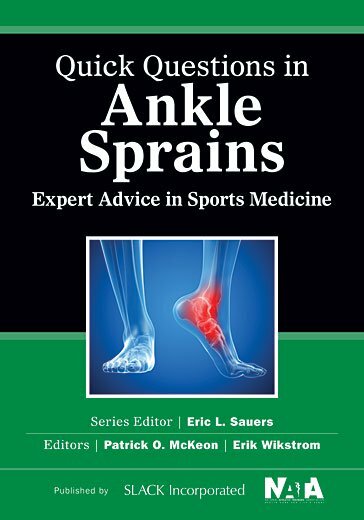 Co-published with the National Athletic Trainers’ Association, Quick Questions in Ankle Sprains: Expert Advice in Sports Medicine provides concise answers to 39 frequently asked clinical questions. Written in a conversational tone, the authors of the individual questions represent a variety of different backgrounds and are experts in their respective field. The variety of questions and brevity of responses will make this a book that is easy to read and reference at the point of care. o What effect does prophylactic bracing and/or taping have on reducing lateral ankle sprain risk? o What are the most useful clinical tests to accurately diagnose syndesmotic and medial ankle sprains? o To what extent should I use manual therapies to treat ankle sprains and chronic ankle instability? o When should I refer my patient with an ankle problem to an orthopedic surgeon? Quick Questions in Ankle Sprains: Expert Advice in Sports Medicine is the perfect at-your-side resource for the athletic trainer, team physician, or sports medicine clinician looking for practical answers to sports-related ankle sprain questions. The concise and conversational tone allows the reader to readily apply the information into their everyday practice. Question 1 Why Are Lateral Ankle Sprains so Common in Sports and Physical Activity? Question 2 How Does the Incidence of Lateral Ankle Sprains Differ Across Sports and Physical Activities? Question 3 What Are the Most Common Modifiable Risk Factors for Lateral Ankle Sprains? Question 4 What Are the Most Common Nonmodifiable Risk Factors for Lateral Ankle Sprains? Question 5 What Are the Contributing Factors for Recurrent Ankle Sprains and/or Chronic Ankle Instability? Question 6 What Effect Does Prophylactic Bracing and/or Taping Have on Reducing Lateral Ankle Sprain Risk? Question 7 To What Extent Does Ankle Bracing or Taping Impair Functional Performance? Question 8 What Types of Preventive Exercises Could Help Reduce an Athlete’s Risk of Suffering a Lateral Ankle Sprain? Question 9 What Is the Comparative Cost-Effectiveness of Lateral Ankle Sprain Prevention Strategies? Question 10 How and Why Are Ankle Sprains Graded? Question 11 What Are the Differences in Key Clinical Features Among Syndesmotic, Medial, and Lateral Ankle Sprains? Question 12 What Are the Most Useful Clinical Tests to Accurately Diagnose Syndesmotic and Medial Ankle Sprains? Question 13 What Are the Most Useful Clinical Tests for Accurately Diagnosing Acute Lateral Ankle Sprains? Question 14 How Well Do the Ottawa Ankle and Foot Rules Help to Accurately Rule Out Ankle Fracture? Question 15 What Are the Concomitant Injuries That Occur With a Lateral Ankle Sprain? Question 16 What Criteria Should Be Used to Diagnose a Patient With Chronic Ankle Instability? Question 17 What Functional Tests Best Identify Functional Impairments Following a Lateral Ankle Sprain? Question 18 What Diagnostic Imaging Techniques Are Used to Further Evaluate Syndesmotic, Medial, and Lateral Ankle Sprains? Question 19 What Are Important Diagnostic Considerations for the Pediatric Ankle? Question 20 Should I Immobilize and Restrict Weight Bearing for an Acute Ankle Sprain and, if so, With What and for How Long? Question 21 What Is the Most Important Immediate Treatment Following an Ankle Sprain? Question 22 What Are the Most Important Components to Include in a Rehabilitation Program Following an Ankle Sprain? Question 24 What Is Cuboid Syndrome Following Traumatic Lateral Ankle Sprain, and How Should It Be Treated? Question 25 What Criteria Should I Use to Return an Athlete to Sport After an Acute Lateral Ankle Sprain? Question 26 How Effective Are Foot Orthotics in Treating Impairments Associated With Ankle Sprains? Question 27 To What Extent Does Intrinsic Foot Muscle Strengthening Enhance Rehabilitation Outcomes for Ankle Sprains? Question 28 How Should I Design a Rehabilitation Program for Chronic Ankle Instability, and How Long Should It Last? Eric Eils, Prof. Dr. rer. medic. habil. Question 29 What Is the Role of Proximal Strength and Neuromuscular Training in Ankle Rehabilitation? Question 30 To What Extent Should I Use Manipulative Therapies to Treat Ankle Sprains and Chronic Ankle Instability? Question 31 What Physical and Pharmacological Agents Are Useful When Treating Ankle Sprains? Question 32 How Much Should I Be Concerned About Persistent Laxity Associated With the Lateral Ankle Ligaments? Question 33 What Should Be Considered When Rehabilitating a Pediatric Ankle Sprain? Question 34 What Are the Most Appropriate Patient-Oriented Outcome Measures to Use for Gauging Disability and Functional Recovery During Rehabilitation Following Ankle Sprain? Question 35 When Should I Refer My Patient With an Ankle Problem to an Orthopedic Surgeon? Question 36 Which Surgical Technique Produces the Best Clinical Outcomes in Lateral Ankle Sprains? Question 37 What Are the Key Rehabilitation Considerations for Producing the Best Clinical Outcomes Following Lateral Ankle Reconstruction? Question 38 What Are the Surgical and Rehabilitative Treatment Options for an Athlete With a Combined Syndesmotic and Lateral Ankle Sprain? Question 39 What Are the Surgical and Rehabilitative Treatment Options for an Ankle Sprain With a Chondral Defect? Patrick O. McKeon, PhD, ATC, CSCS is an Assistant Professor in the Department of Exercise and Sport Sciences at Ithaca College and serves as the Clinical Education Coordinator for the Athletic Training Education program. Prior to coming to Ithaca College, Dr. McKeon served as an Assistant Professor within the Post-Professional Athletic Training program and the Rehabilitation Sciences Doctoral program at the University of Kentucky. He earned his bachelor of science degree in Athletic Training from Springfield College, his master of science in Sports Health Care from the Arizona School of Health Sciences, and his doctorate of philosophy in Sports Medicine from the University of Virginia. Dr. McKeon’s research interests include understanding and enhancing recognition, prevention, and rehabilitation strategies for ankle instability. He incorporates a holistic research perspective, which combines patient-, clinician-, and laboratory-oriented outcomes to capture the broad spectrum of functional issues related to this clinical phenomenon. Erik A. Wikstrom, PhD, ATC, FACSM is an Associate Professor in the Department of Kinesiology and the Co-Director of the Biodynamics Research Laboratory at UNC Charlotte. Prior to coming to UNC Charlotte, Dr. Wikstrom served as the Director of Undergraduate Athletic Training in the College of Health and Human Performance at the University of Florida. Dr. Wikstrom earned his bachelor of science degree in Athletic Training/Sports Medicine from Roanoke College and both his master of science degree in Exercise Science and his doctorate of philosophy in Health and Human Performance from the University of Florida. Dr. Wikstrom’s research focuses on the interactions between musculoskeletal biomechanics and sensorimotor control of the lower extremity following injury, with particular emphasis on the coordination of balance in those with ankle joint pathologies.